The first arrives late tonight into early Saturday, with the majority of the precipitation falling to our south. The map below is taken from the MWN Storm Center and shows the warnings and advisories in effect as of 3:45pm. 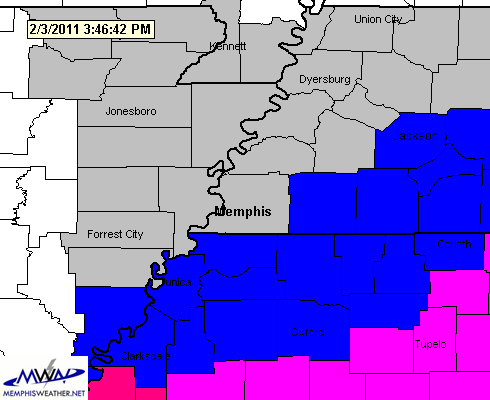 A Winter Weather Advisory (blue) covers most of north MS and a few counties in west TN, while a Winter Storm Warning (pink) is in effect further south. The metro Memphis counties will see light snow begin by dawn Friday morning, remaining light snow through the morning. We could see rain mix with the snow in the afternoon as the temperatures rise a little above freezing. By evening, remaining precipitation changes back to snow. I don't expect widespread precipitation here, as it will be further south, but rather scattered snow and rain showers with light amounts. Accumulations will likely range from a dusting north of the city to perhaps an inch in the city (which may not all stick as temps rise into the mid 30s in the afternoon) to a couple of inches south of the metro. 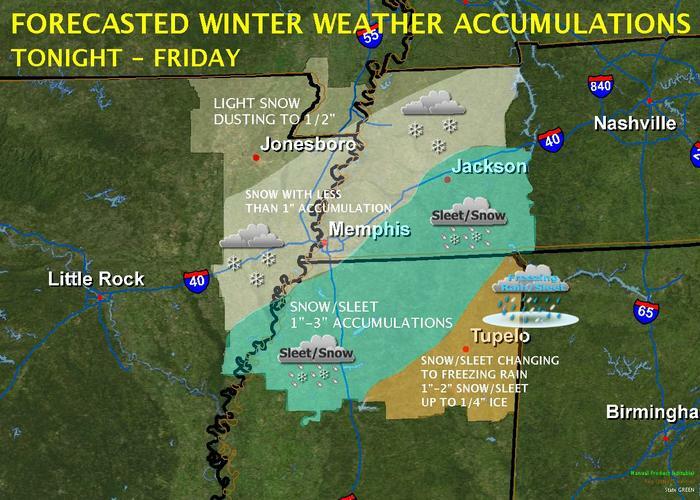 The NWS has published a map showing expected snow amounts, also shown below. The next system will be more about cold air than winter precipitation. Light rain or snow is again possible Sunday night into Monday, but it will be followed by very cold temperatures for the rest of next week. Precipitation amounts will be light if any with this system. Finally, one mid-range model is showing the possibility of a significant winter storm for the middle of next week. Another, perhaps more reliable, model is not showing that system as of this afternoon. We will continue to monitor the situation and keep you updated! Check the MWN Forecast daily for the latest details.